Kudos to Matt Vance for resurrecting the BarCampBank brand, with the forthcoming BarCampBank Seattle on February 9th. Almost six years ago Jesse Robbins held the first North American unconference focused on banking. How damn prescient in light of the financial crisis that would begin to erupt later that year and go full-blown a year or so later. Way before anyone thought of occupying any street. For me, new to financial services at the time, it was a chance to form a community that has nourished me to this day. Many of us were embracing social media and met for the first time in Seattle on July 21st and 22nd, 2007. I wrote several posts about it at the time, including a sum-up on NetBanker. 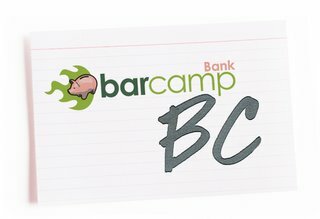 We created a couple of BarCampBank BC sessions in the two years that followed (with the fun acronym BCBBC). I think the time is absolutely ripe for a continuation of the dialogue, but in the time since the BarCampBank days, I have changed my focus from digital to community investment. BarCamps, which come out of the tech and dev world are steeped in discussions about technology and its power to disrupt. Personally, I want to move past talking about technology and to something much more deeply rooted and philosophical. I want to talk about values-based banking. Because if community banks and credit unions don’t start increasing their relevance, there’s no need for many of them – perhaps most of them – to exist. And looking at the movement towards strengthening local economies, combined with a pursuit of more sustainable and ethical business practices, we have a giant opportunity to focus ourselves on something meaningful. Reconnecting our cooperative and local heritage to the modern, engaged consumer and citizen. 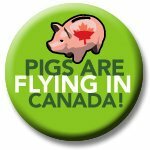 I’m starting to get really excited about BarCampBankBC, which is happening the weekend of September 20th here in beautiful Vancouver, BC. It should prove to be an amazing coming-together of some great minds in the world of banking, credit unions, social media, technology, innovation and social responsibility. …if you’re thinking of coming to BarCampBankBC, please take a minute to register now! It’ll make the lives of the three organizers, me, Gene and Tim, a little easier. PS: I’m about to go to Alaska on a cruise with Amy and Ivan (my wife and son), so if I don’t publish comments quickly or at all, please forgive me! PPS: It’s almost exactly a year since the first North American BarCampBank in Seattle, where so many great relationships and conversations started. A great milestone!